The C.S. 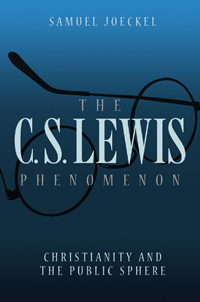 Lewis Phenomenon names the way in which Lewis’s presentations of Christianity in both his fiction and non-fiction depend upon the conventions of the public sphere—this study explores three facets of that phenomenon. The first concerns Lewis’s accomplishment as a public intellectual. The conditions enabling this accomplishment develop from the public sphere, which arose at the turn of the eighteenth century and seminally established the conventions of public discourse for centuries. Not long after Lewis’s death, the public sphere fragmented and crumbled; the public space of critical-rational debate ceased to exist in the form it maintained for centuries. Consequently, Lewis’s accomplishment was both unprecedented and inimitable: he made use of the public sphere like no other Christian in history, and since the public sphere no longer exists, his accomplishment will never be repeated. The second facet concerns the anomalies within the body of Lewis’s works— texts that engage particularity and precognitive forces that contextualize belief, thus moving Lewis beyond the public sphere—a counter-narrative to the first. Conceiving Lewis as a public intellectual also provides a useful meta-critical lens for exploring his symbiotic relationship to the public sphere, revealing how his place within the public sphere mirrors its rupture. A meta-critical analysis also sheds light on the Lewis industry, highlighting the curiosities that have characterized Lewis scholarship from its beginning. These issues comprise the third facet of the Lewis phenomenon.